It’s that time of year again… CHRISTMAS CUBE DECORATING TIME. 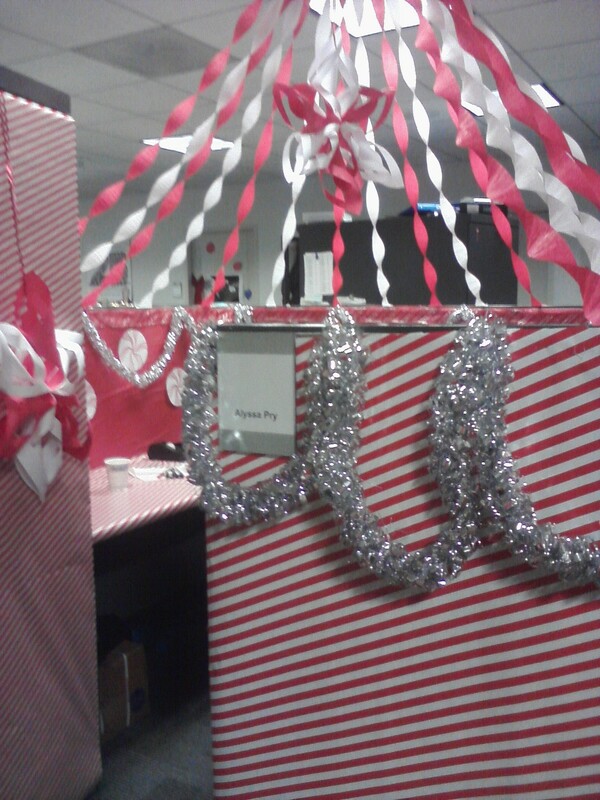 This will be year two of the now infamous cube decorating contest, and everyone is bringing their A-game. After last year’s smashing success of my “Peppermint Pavilion,” where I won awards and acclaim for my artistry and creativity…O WAIT. I DIDN’T WIN ANYTHING. I WAS NEITHER AWARDED NOR ACCLAIMED. I put a lot of effort into that masterpiece, and spent an entire week wearing the same red-and-white striped blouse because they kept moving the judging time! And then to have my glory ripped away from me like a tattered shred of peppermint-printed paper…it still stings! If you couldn’t already tell, I’m a pretty competitive person, and have been looking at last year’s experience with a critical eye. I think my over-zealous nature was a real hindrance last year, because by the time I was done, people were just starting! So this year, I’m holding my cards close to the chest! I’ve been laboring away at cranking out my decorative elements in the darkness of the night and will start constructing when curiosity is at its peak! I’m also adding lights, because that was apparently the only criteria that upstaged STREAMERS TWISTED FROM THE CEILING IN A VISUALLY PLEASING WAY. Needless to say, IT’S ON. And to the people who stole the “Most Traditional Christmas” title away from me….YOU KNOW WHO YOU ARE. And actually, one of them doesn’t even work here anymore, so that’s one less obstacle towards redemption! What a lovely weekend! Christmas was great this year, mostly because I wasn’t comatose! Last year, I worked the overnight shift at my old job on Christmas Eve and Christmas night, and spent the time in between napping and feeling miserable about life. This year though, I enjoyed our yearly Christmas Eve party, sang Christmas carols at our family sing-a-long, and indulged in holiday french toast and Bloody Mary’s (not at the same time…that would be gross). All and all, the mood this year was rather jovial! I was in a particularly joyful mood at the start and end of my little Christmas break because Santa was in an especially giving mood and decided to grant me two Christmas miracles to ring in the season. The first was that it only took me an hour and a half to get home the other night. I honestly wasn’t sure what to expect on the Thursday before Christmas, and the Port Authority did not disappoint. There were pigeons flying around INSIDE while I was waiting for the bus, and a half-naked crazy person was passed out on a bench I happened to be standing directly in front of. That place is literally the 10th circle of hell. When I finally got on the bus, it was only after practically inhaling a dose of lung cancer from all the bus fumes! But amazingly, we zipped out of the tunnel and onto the parkway and I was eating dinner with my sister and making sugar cookie dough before 7:30! So thank you Santa, for restoring my sanity another day. The second Christmas miracle occurred yesterday, when my parents drove me back to my apartment. Last week, the place was topping out at at least 90 degrees, and I finally called my landlord in a heatstroke-induced rage and begged him to send a plumber to fix it. On Thursday morning, one finally appeared like a wise man sent to Jesus, equipped with a two-foot long wrench to turn my radiator off. When I walked in yesterday and didn’t see a mirage in the corner, I knew joy had come to the world. Have I mentioned lately how much I ADORE my job?! Between the cube decorating contest, the office holiday party, and the free Christmas cookies that got dropped off yesterday, work life is pretty grand. But throw in a Secret Santa party, and BOOM! Best week ever! The past few weeks have been really fun, because I’ve been getting to know some of my coworkers a lot better. I don’t know if it’s because I’ve been working a lot lately so I see them more often, or because I’ve been so much calmer and happier since moving to the city, but we have quite the little social circle at the office these days. 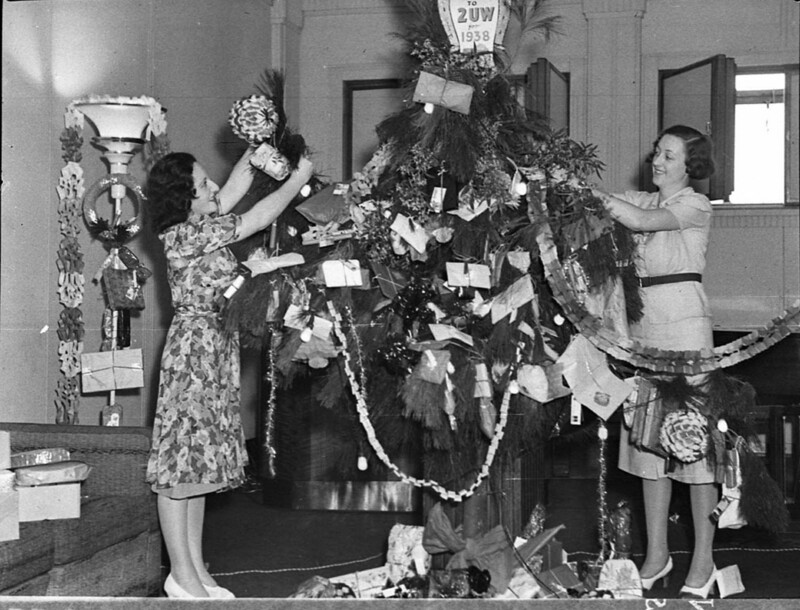 And one of the most brilliant ideas to stem from our scheming was a Secret Santa. Now the last time I did a Secret Santa was in 6th grade, and I don’t even remember what I received. All I know is that it was NOT a set of milky pens, and I was devastated. My family never really fares well in these random gift exchanges anyway–one year my sister got a bottle of nail polish with bite marks in the cap and a used barrette. Gross! But of course, this Secret Santa was organized to the T–we could even make a wish list, to avoid–as one co-worker put it–that “O…thankssss!! !” moment. We had our little party yesterday, and everyone loved their gifts! I got my person a gift card, but tried to disguise it in a cupcake box. Despite the fact that she shook the box, flipped in over, and opened it upside down, the cupcake was miraculously still in tact! A Christmas miracle! And I got exactly what I asked for–a new pair of headphones! 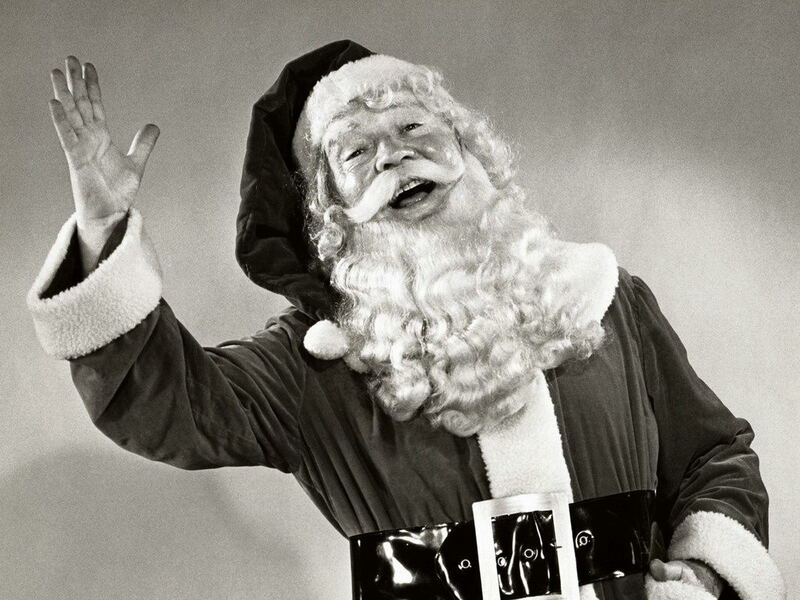 I’ve been blasting Christmas music all day–I’ve heard Sleigh Ride ten times so far…with full stereo mix in both ears! It was a fun afternoon, and everyone walked away with some Christmas cheer and another nice work memory. Friends! So the results are in and I walked away EMPTY HANDED. So upset. 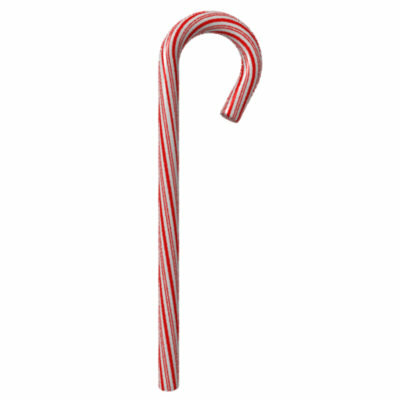 I’m drowning my sorrows in peppermint schnapps and my leftover candy canes. Looking back, I think I peaked too early. I was finished with my creation on Tuesday, and people were putting newer things up everyday. Maybe I was the cool kid on the block on Tuesday, but by Friday, it was old news. Plus, the placement of my cube put me at a disadvantage–I was behind the famed “gingercube”, which, sure, was cool….but I wrapped my pencil cup people! Isn’t that worth anything?! Apparently not. Out of four awards given last night, I didn’t even snag “Most Traditional Christmas.” Perhaps it was my lack of bribes. Unlike my coworkers who plied the judges with cookies and sweets, I was handing out peppermints, like a musty old grandma. Well, I thought it was pretty. AND I THINK I SHOULD HAVE WON SOMETHING. The finished product! Listen, you can’t say I didn’t stick to my theme! HOW DID THIS NOT WIN AN AWARD? Like, for serious. I hung streamers from the ceiling in a visually pleasing way! I hand-crafted thirty peppermints! I HUNG TINSIL! The world is unfair. I lifted my computer up to paper underneath, and I have zero upper body strength. And all for naught! Of course, everyone’s favorite detail was my screen saver, something that took me 3 seconds to choose. 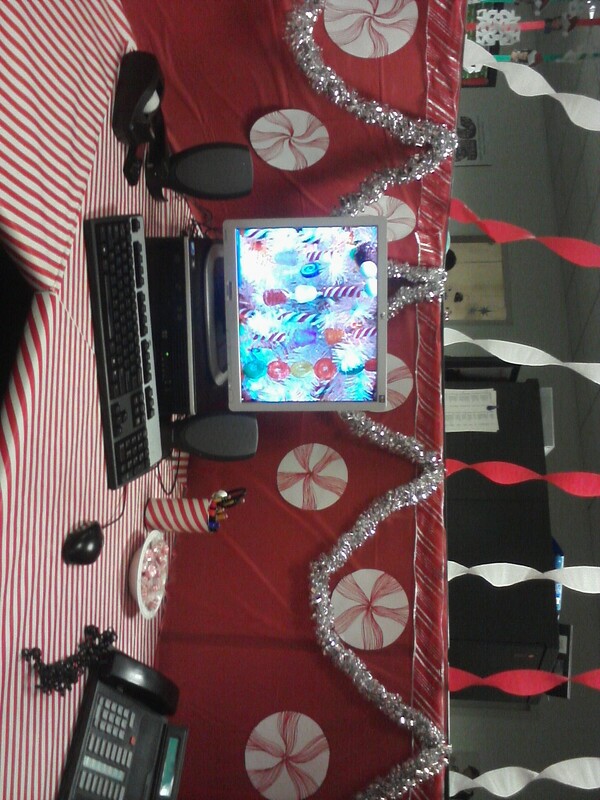 Disregard the fact that I spent 3 hours decorating my cube and suspended things from the ceiling. The highlight was obviously this screen saver. Obviously. IT IS ON! 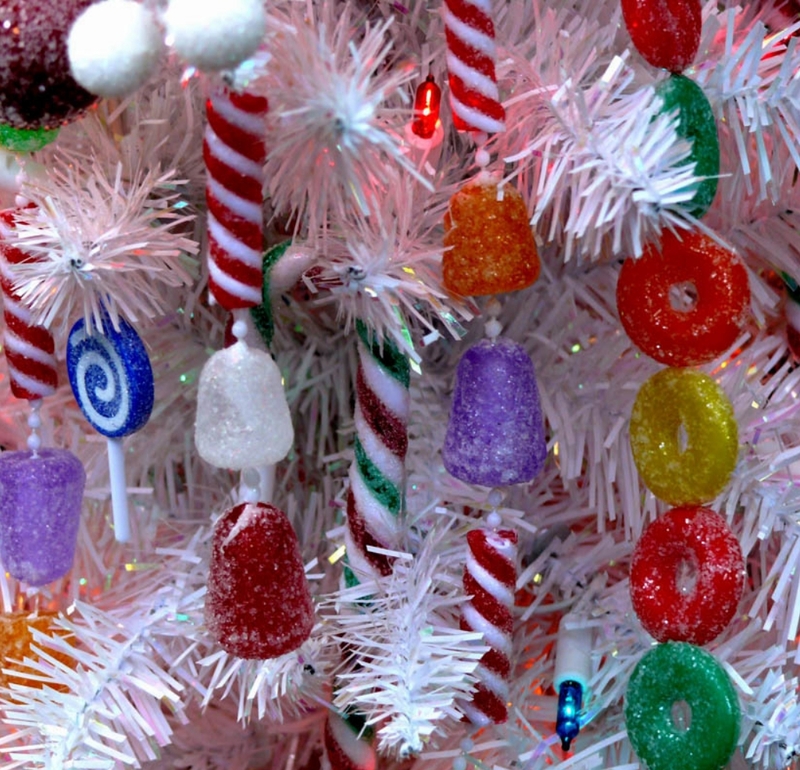 Last Friday, it was announced that there would be an office decorating contest for the holidays, and like wild-fire, ideas were brainstormed, Youtube how-tos were viewed, and dollar stores were ransacked. In the haze of my life last week, I spent an unacceptable amount of time trying to think of ways to build an architectural model of an igloo that would be suspended above my cube, before realizing that idea was a. Crazy and b. Logistically impossible given the time constraints and my complete lack of architecture knowledge. 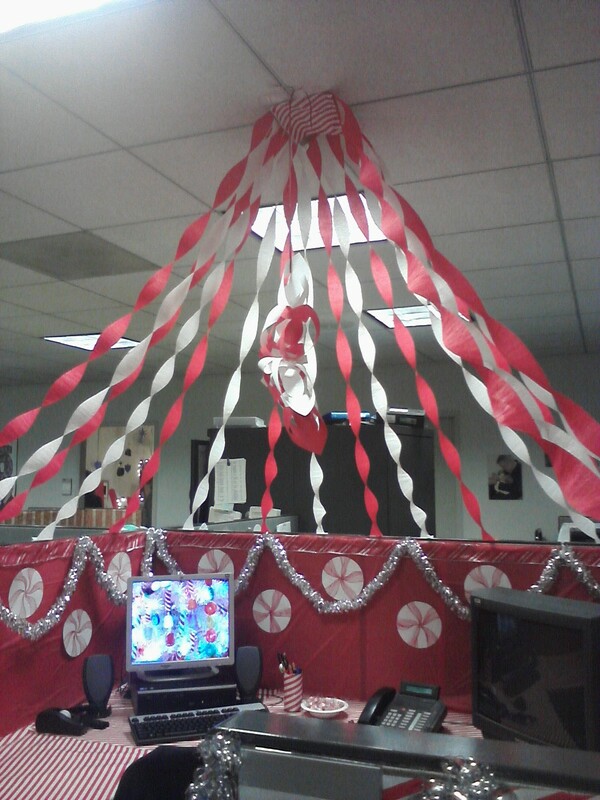 So I settled on the next best thing: Turning my cube into a giant peppermint. Of course, this idea came after many minutes of plotting and formulating with my coworkers, who had already gotten started wallpapering every free surface with wrapping paper and had snipped snowflakes from leftover computer paper. I was so wired after my insane work week I ended up staying up until 5 am Friday night, ideas whirling through my brain at rapid speed. While I’m a bit ashamed to admit it, sometime between the hours of 3 and 4 am I drew out my master plan, made a list of materials, and fashioned a to-do list. Type A, anyone?? I may have a healthy sense of competition, but it has become a throw down around here! It’s floor against floor, cube against cube! We do not mess around in this office! Let’s just hope I can get it all done by Friday..I still have at least 20 peppermints to crank out before all is said and done! And can I really compete against my colleague who spent SEVENTY DOLLARS on decorations? Only time will tell….Friday is judgement day. BOOM. I am really excited for this weekend because I’m going to put up my Christmas tree! And this ain’t no Charlie Brown tree–this is a genuine four foot Canadian pine….except that it’s fake. Listen, I live in an apartment now…it’s a fire safety issue. Also, it was $10, as opposed to the $60 those sidewalk tree stands get! There were two things that I was most excited about when I decided to move into my own place: 1. I would be close to work and 2. I would get to decorate it for Christmas. I’m not some crazy Christmas fiend or anything, but I can’t stress enough how delightfully un-stressed I am these days, and I’m just really enjoying life right now! During last-year’s holiday season, I was in abject misery, working through the night and questioning every life decision I’d ever made–not exactly the way to get into the holiday spirit! This year, I’ll actually get to enjoy the holidays! Frankly, it was difficult to not put my little tree up Sunday night at 11 pm, when my parents dropped me off after the Thanksgiving weekend! At least I know what I’ll be doing tonight–hitting that dollar store down the street for some totally tacky Christmas decorations to go with my little gem of a topiary. My faded cut paper snowflakes from college aren’t going to cut it this year! I have an apartment to fill with holiday cheer, and a mood to match!